W e here at the Rosenberg Archive, and our dedicated team at the Rosenberg Museum often receive requests for information about the life and achievements of the great Australian composer and violinist, Johannes Rosenberg ( not to mention a lot of stuff that comes in about violins -ed ). We try to attend as many queries as our meagre resources allow, but every so often a few come in where we just don't know where to start. Hence this Rosenberg FAQ page. We hope that in the interests of musical scholarship, someone out there might be able to help with new information on the topics presented by our readers, or even to ask a question themselves. A great many of the questions we do receive are already addressed in the book the pink violin and its companion volume Violin Music in the Age of Shopping . A selection of chapters from these books can be accessed via the Rosenberg Archive home page . Questions may, as usual, be posted by clicking on the link, likewise if you can help with any of the queries below. Responses will be posted as soon as possible after they are received. click here for previous FAQs. Enschuldegung mein deutsh ist sehr schlect. home at the end of the night, I didn't ask for her email. out how her travels are going. address letters of such a personal and sensitive nature. Rosenberg, the sister of the late musicologist and violinist Dr.
researching his new Fibonacci Fence designs). the hell of it and already have one (badly) built model. Mr.
you can see and hear it. ( editor's note ) . We are always eager to hear about new experiments with violin technologies. Please keep our readers informed through this site. well , i've been triyng to find out the history of his maker. I guess we need a Kriml page. purposes. Better than most made today. various articles I have found on the internet this morning. had stolen his wonderful violin, and that it was a famous Strad! and a loyal friend to my mother. Olympics. Canadians? Well they play with it. your readers might be interested in this - j.
I want to be a violinist. No, Mother. there is a violin in my closet. A brand new, Fengling FV-010 violin. played. But these fingers aren't for playing the violin, Mother! They, my fingers, are for BOWLING! out there telling us we can't be bowlers. and email it to me as well. I promise not to show mother. fine tuners - fine tuners make tuning easy. Fitted with steel strings. BOW comes with genuine unbleached mongolian horsehair. school or orchestra practice no problem. Only Will ship to United States, Canada. Will ship when payment is received. I AM BIDDING ON AN OLD KRIML  VIOLIN, CASE ,BOW . TO GREAT COND. FACTORY YEARS , VALUE , ETC. ABOUT THE KRIML  COMPANY . the Rosenberg Museum earlier this year. "Crucifix Violin ca. 1945". And smelled a rat straight away. of the Japanese "Kamikaze" fighter-bomber of WWII. Force as a kamikaze pilot at the end of that war. figure 1. 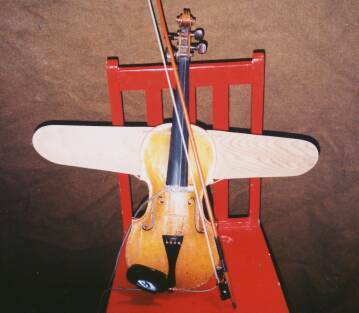 The "crucifix violin" but regarded as the "kamikaze violin". Note the aerodynamic (jet wing) property articulated by the angle of the bow. The detonator wires can be clearly seen. artist would resort to a gimmick like that? I want buy old violon. How much you sell? violin that has Jan Kriml-made in Germany- BKN on the label inside. de Ifer 1840. Can you tell me what it's approximate value might be? resonant, and the instrument is in very good condition. spoke about his brother to you or if you ever met him. without question. I knew his niece intimately but not the uncle. become so taken by it that they quite literally put it on a pedestal. subject of further musicological study pending government assistance. in the Acropolis in 20BC. © 2004-8 The Rosenberg Archive inc.